These past few months we’ve been doing a lot more eating in while recipe testing for our upcoming best of New York street food cookbook. Last week I gave you a sneak peek at the Tea Eggs from the Bian Dang Truck. Now here’s a look at my newest obsession, Jalapeño Cheddar Corncakes from Big D’s Grub Truck . . . I first fell in love with these corncakes at the truck in midtown in 2011. As someone who grew up eating regular ol’ Aunt Jemima pancakes they were a revelation. 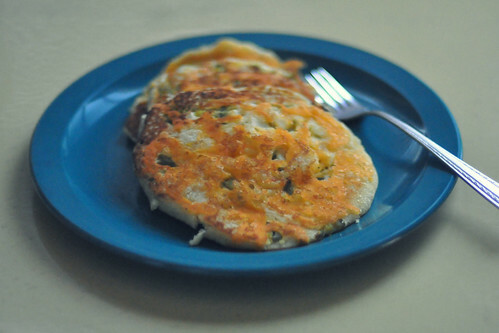 Sweet, salty and spicy, not to mention crispy from the little fried cheesy bits—these pancakes hit so many satisfaction points, you’ll find yourself going in for a second helping. Word on the street is the Big D’s may relaunch breakfast service soon. Keep tabs on them via twitter @bigdsgrub.